Olga Mandodari Sokolova is a disciple of Dr. V. Sthapati Ganapati, a well-known traditional architect of Southern India who has relied on Vaastu principles in most of his projects. Olga received her certificate as Vaastu Shastra Consultant from the International Institute of Mayonic Science and Technology, Chennai, India in 2005 after completing classes conducted by Dr. V. Ganapati Sthapati. She continued taking classes from her Teacher till he passed away in 2011. 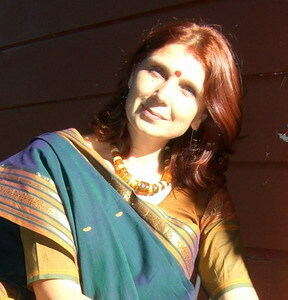 In July 2007, Olga Mandodari assisted Dr. Sthapati in his lectures at the Sivananda Yoga Center in Val Morin, Canada, and is herself a guest lecturer for the last eleven years. Her first publication, llustrated Research Papers on Mayonic Science and Technology of Kumari Continent, was published in India by her Teacher. In 2016 Olga Sokolova translated into Russian language and published with the permission of her teacher his most voluminous and serious work, the book "The Architecture of Shtapatya Veda". In 2017 she published her own book "Your Happy House - Illustrated Vaastu Shastra for Everyone". The book is beautifully illustrated by Alsu Halilova, the artist from Moscow and edited by Hank Goldstein. She also designed and manufactured special meditation structure based on the theory of Vaastu Shastra design. This structure is called Vastu Meditation Vimana. Olga continuously gives lectures and workshops about the essence of Vaastu Shastra which is a true base for the sacred geometry and holistic architecture. She holds her lectures with Sivananda Yoga Vedanta Centers in Europe, Canada, U.S.A. and travels to Russia with her educational courses. 2012 September - Received Ph.D. from The Open International University for Complementary Medicines, Colombo, Sri Lanka affiliated with The International Institute of Integral Human Sciences, Montreal, Canada. According to the death will of Dr. Ganapati Sthapati Mandodari is a Member of Vaastu Vedic Trust, Mamallapuram, Chennai, India (List Trust Members).